Fiction – paperback; Vintage; 224 pages; 2005. 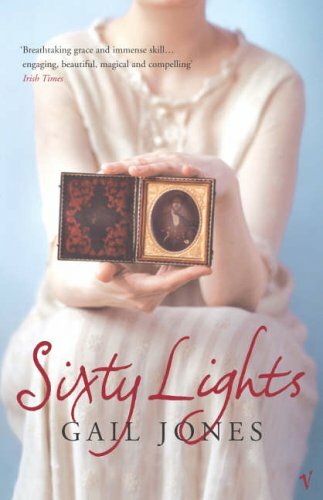 Sixty Lights by Gail Jones is a compelling, captivating novel about one young woman’s drama-filled life in Victorian times. Orphaned as a young child, Lucy Strange and her younger brother are brought up by a slightly eccentric uncle. Leaving their native Australia, the family moves to Dickensian London, a city that was “too vast, too chill and altogether too drear”. Later, Lucy sets forth for the more exotic India, where she sets up home with her uncle’s fey friend in a wealthy European enclave of Bombay. Throughout the ups and downs of her life (love affairs, depression, oceanic travel) Lucy keeps a diary “bound in purple morocco and tied with a black ribbon” where she “recorded and stored her apprehensions, not of events, but of images”. She calls this diary Special Things Seen. Her eye for detail is so keen she becomes a photographer, recording the people, places and objects that so deeply affect her. Given that Lucy is to meet her death when she is just 22 – this fact is revealed to the reader at the very start of the novel — her eye for beauty, photographic talents and passion for life resonates even more strongly, because you know (that she doesn’t know) that she’s running out of time to make every moment count. It is ripe with symbolism and littered with references to photographic processes and techniques (for instance, from page 5, “the blinding flash of a burnt magnesium ribbon”). There are multiple layers of meaning that aren’t fully appreciated on just one reading. I don’t re-read books but I feel that with this one, I must. And I know I will enjoy it just as much, if not more, second time around. Thanks for the recommendation. I’ve been meaning to get to Gail Jones, and now I most certainly will. I love to reread, by the way. I almost never read a book just once, because I find it’s the only way I can take in both the architecture and the details, their interrelationship. Alas, I’m also a very slow reader, or have become so in recent years. I’d had ‘Sixty Lights’ on my shopping list for a while. Then, last weekend, I happened to spy it on a sale table in my local shopping centre. At $7.95 it was a steal, so I snapped it up, despite being on a tight budget this month. Lee, yes, I’m sure you will love this book . . . worth hunting out a copy. Dean, that sounds like my kind of bargain! I can’t believe how expensive paperbacks are in Oz. Please nominate this book on your next book discussion. Thanks for this post–the book sounds wonderful. It wasn’t published here, but I am going to try and get a copy through ILL from another library! Thanks for your review. I’ve bought a copy of Sixty Lights on the strength of it. It sounds like a book to savour slowly so I’ll save it for some quiet days. I saw Gail Jones’s latest novel, Dreams of Speaking, in the library the other day, so I grabbed it. I hope I haven’t waxed too lyrical about this book. One thing I didn’t mention in my review is that the reason “Sixty Lights” resonated so strongly with me is that it captures the emigre experience so well – her descriptions of London as seen through an Australian’s eyes are pitch-perfect, even if those eyes gazed on London more than a century before mine!